There are those who believe in ghosts, and those who adamantly don’t. But when it comes to ghost town walks – whether or not they happen to be “haunted” – there is something about the gruesome history of Hull that is inherently... creepy. Go on a wild tour of Hull (One of the oldest cities in the Uk) and move around its inner walls. Meet the ghosts, daily sightings, paranormal activities and hear it's true stories. As images of the past, Hull's ghosts invite us into a different time and space all together. They drag you into another generation, with all their hopes, fears, loves and tragedies being experessed onto us, inside the walls of its real buildings, roads, court rooms, underground tunnels, jails and hangings sites - Kingston upon Hull. The spirits remaining are monuments to Hulls impermanence, with haunting reminders of our own mortality. Hull has over a 1 000 ghostly sightings and 100's of psychical ghostly touches making Hull one of the UK's Most Haunted Cities. The interactive tours bring energies, poltergiests and shape shifters quite literally 'Alive' you really do personally explore each terrifying situation as it is presented to you, gaining a knowledge that the events unfolding really did happened. YOU WILL JOIN IN! like it or not, as you try out your own psychic abilities. Where the past comes to life around every twist and turn, just to meet you. Enjoy the ghost walks and experience the UNDEAD as many of Hulls Most Haunting memories and terrifyng characters join you! Make sure you avoid the witches curse or the widow makers looks for they are all after your soul whether is is good for them and bad for you. 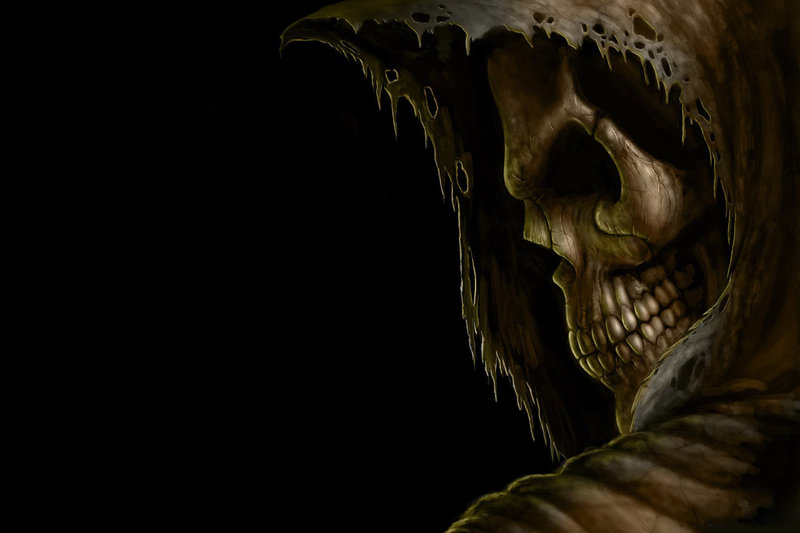 DO YOU FEAR THE DEAD? LEARN WHAT IT IS ALL ABOUT! Join us for a Scare filled night were the Ghosts meet you! We will take you on a 'live' scare tour. Horrible history quite literally comes alive!!! 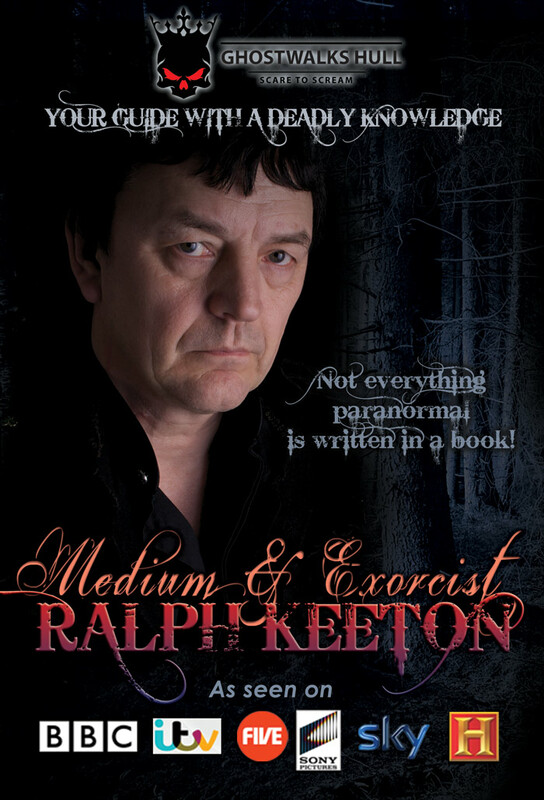 Ralph Keeton your host is a Medium and Exorcist, who to this day travels and talks on all matters regarding 'Spirits, 'Energies', 'Anglelic Signs' and 'Unnatural forces' beyong your imagination. Ralph has worked alongside many of today's major corporations, industries and specialised units to help understand how and why energy contact is possible. Appearing with the likes of 'Most Haunted', Derek Acorah, Colin Fry, Stephen Holbrrok, Gordon Smith and many TV personalities including recently Joe Swash on his own BBC program 'I Believe'. Ralph has rked on all the terrestrial TV stations and Sky's major channels. Ralph has also had audience viewing figures of over 30 million with his 'Special' for the Worldwide Brazillian TV Globo TV "Exorcisms". Currently Ralph is working on his own tour travelling the UK and USA to look at and providing the public a close liasion with spirit. We boast a TV Medium/Exorcist tour guide and one of the worlds dealiest men. Walk amongst and in some of the most haunted buildings in the UK. 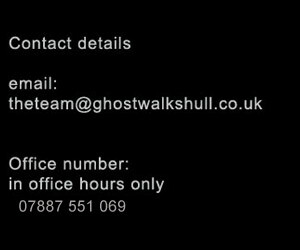 Ghostwalks with award winning live performances of the real ghosts stories. WARNING NOT for the squeamish! Have you a corporate night out to organise? Have your group try something with a real diffrence. Why not sponsor or advertise at one of our unique events.